What began as a dream five years ago finally became a reality this Saturday morning when the National Blues Museum on Washington Avenue in downtown St. Louis opened its doors to the public for the first time. Why St. Louis? This was a question asked at a special media preview event on Thursday. After all, there are other cities like Memphis, Chicago or Kansas City that could easily claim as much, if not more, of a piece of the history of America's own musical art form. Museum board chair and blues musician Robert Endicott (also a partner at Bryan Cave, LLP) noted, "St. Louis is on the path of the blues' Great Migration north. Every stop along the way, the musicians put their own stamp on it -- there's a Chicago style, a Memphis style. We're right in the middle of that pathway, so it makes sense for us to tie it together. But as to 'why here?' -- no one had done it -- so we decided to do it." The team at the helm of the museum has an appropriately impressive background. Founding Executive Director Dion Brown was recruited from Indianola, Mississippi, where he served as the Executive Director of the B.B. King Museum and Delta Interpretative Center. Interpretive Manager Jacqueline K. Dace, responsible for the museum's educational programming, formerly served as Project Manager for the Mississippi Civil Rights Museum. A St. Louis native and Webster University graduate, Dace returned home for the opportunity. The museum is beautifully designed by San Francisco-based Gallagher &Associates, an international museum design firm with a striking resume of projects including The Grammy Museum in Los Angeles, the Motown Museum in Detroit, the Cleveland Museum of Art, and the Academy of Motion Picture Arts and Sciences, among others. Their expertise was augmented by creative advisor, Robert Santelli, Executive Director of the Grammy Museum. As guests enter the 23,000 square-foot exhibit space, they can enjoy a brief film on the history of the blues and its impact on American music, narrated by none other than Academy Award-winning actor Morgan Freeman. The exhibition moves chronologically through the earliest roots of blues music, from the cotton fields of the Deep South, to its Great Migration north from the Mississippi Delta and the evolution of the form into modern blues and rock 'n' roll. 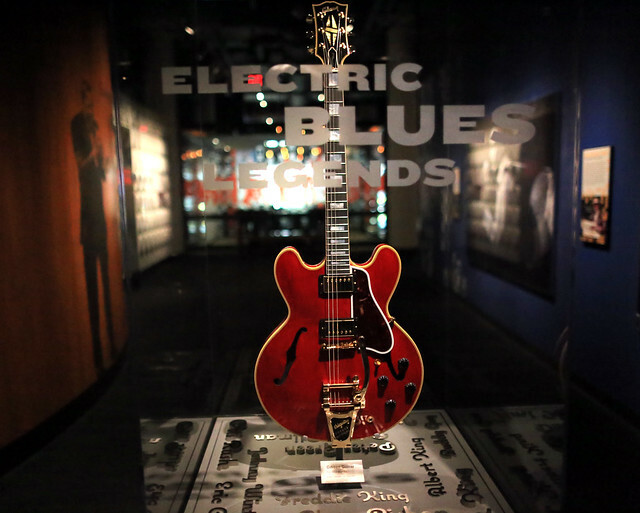 Some highlights include a special section on Women in the Blues, a case of artifacts from St. Louis' own icon Chuck Berry, as well as artifacts from legend B.B. King, including his infamous guitar, Lucille. In addition to history and artifacts, the museum incorporates technology for some fun, interactive components including a virtual jug band that visitors can join and "play in," as well as the opportunity to build their own blues song as they move through the exhibit, adding lyrics and instrumentation at various stations, culminating in a final "Mix It Up" room, donated by rocker Jack White, where effects and final touches can be added to the song before an MP3 is sent to the visitor's email. A traveling exhibition room complements the permanent exhibits, opening with "Blues @ Home: Mississippi's Living Blues Legends," an interactive portrait series by artist H.C. Porter. Her 31 vibrant paintings of Mississippi-based blues artists are paired with oral histories from each subject. Though only just opened to the public, several prominent blues musicians featured in the exhibit have already visited with a positive response. Brown says, "Bonnie Raitt was here a couple Fridays ago and she was just in awe of it. So much so that, even at her concert that night, she continued talking about St. Louis and how proud St. Louis should be for having the museum here. Bobby Rush has come to the museum at least three times and he was sitting in front of the case where his artifacts are paired with B.B. King's and he got very emotional." The museum states its mission is "to be the premier entertainment and educational resource focusing on the Blues as the foundation of American music." Dace hopes many of the planned live music performances will be used to educate the public further on the style and its history. Board member Scott McCuaig, former President and Co-Chief Operating Officer of Stifel, Nicolaus & Company, notes, "If I had one thing I'd like to see as an accomplishment of the museum, it's that, in the next five years, every student in St. Louis, by the time they reach high school, has already been here -- whether its their history class that brings them through so they understand the migration, or it's their music class that brings them through so they get an appreciation for this style of music. But every kid in St. Louis should come through here on a field trip." A large venue with a raised and lighted stage, complete with a full back line will host live music performances on a regular basis, including both local and national blues acts. Brown says that by Memorial Day weekend they hope to launch live music on Thursdays, Fridays and Saturdays. The venue, connected to the brand new Sugarfire Smoke House BBQ restaurant, is also available to rent for private events. Saturday's grand opening kicked off with a ribbon cutting ceremony with the Normandy High School Marching band leading a procession down Sixth street and Washington Avenue to the front door of the museum. Mayor Francis Slay was on hand along with the museum's leadership to officially cut the ribbon before the doors open. For more information and regular updates on events and exhibits, visit the National Blues Museum's website. Click below to see the complete photos of the event by Bill Motchan.